A pink handbag is a grownup accessory with the right outfits. 3 What Outfits Could I Wear With a Bright Yellow Purse? 4 What Color of a Handbag Goes Best With a Black Evening Dress? A brown tote or black satchel may be your trusty standby, but a hot pink handbag livens up everything from basic denim to a little black dress. There’s no way to avoid attention with a punchy-hued bag, so dive in with both feet and prepare for your pretty pink purse to steal the show. For an easy, classic approach, offset basic white, black or gray with a hot pink handbag. Unless your workplace is ultra conservative, carry your structured bag with a black pencil skirt and white silk blouse, or a simple gray pantsuit. Elevate an evening-out look -- think a solid white or black dress -- with a bright pink clutch. Steer clear of hot pink shoes, which would make for a look that's too matchy-matchy. Instead, carry the color through in a more subtle way, with a bright pink bracelet or a simple pendant. 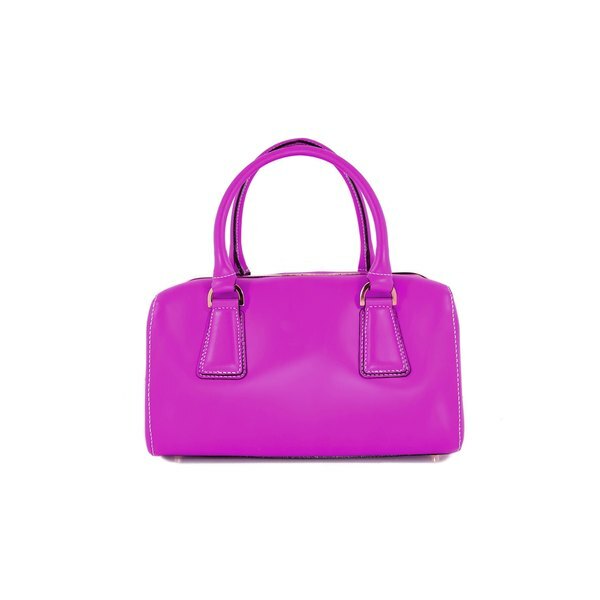 Incorporate a hot pink handbag into a monochromatic look. Work in shades of pink from head to toe, then set off the look with your bright purse. Keep your styling simple with a baby pink frock and hot pink shoulder bag. Or rock light pink skinny jeans, a dusty rose sweater and a hot pink hobo. Finish with basic silver jewelry so you don't detract from the eye-catching color scheme. Light, medium or dark colors of denim -- along with rich navy blue -- function as near neutrals to bright pink. For a casual look, rock boyfriend jeans or denim cutoffs with a white T-shirt, neutral flats and a bright pink tote. Or pair a navy sheath with matching pumps for date night and carry a hot pink clutch. Finish the look with a gold cuff and pink cocktail ring. Flex your fashion muscle with a colorblocked look. Pick a bold shade -- such as turquoise, bright yellow or red, if you’re particularly daring -- and work in hot pink. Team a pair of red skinny jeans with a pink button-down; finish with neutral wedges and a hot pink shoulder bag for a day of shopping. If the color clash is too much, take a more conservative approach -- pair a purple romper with a hot pink crossbody bag and an armful of coordinating bangles.